I've made a tool that helps you choosing the right cover. It will display the previews of the first 10 covers of the search results in Mp3tag. Works only with English or German Mp3tag at the moment. You also need Cover Preview#... src files (see attachment). Copy them to the sources folder as usual. Technically it seems to work. I really appreciate your work, but please let me know, what would be the advantage to use this tool compared to others like 'Album Art Downloader'? What do I have overlooked? It's mainly a tool to enhance Mp3tag. Compared to AAD: It starts faster and you can immediately embed covers in the tag. I've released a new version. Also add &1, &2 and &3 to your favorite scripts so you can call them with buttons or with command line parameters. Again a new version. Now with large previews for all sources. If you want to use it you must also re-download all scripts and install them. I had installed the first version and it worked good at some quick test. Now i installed the lastes version (1.2). I deleted all files of the old version before. Your tool fails now to load the preview files. I got alway a white preview, but with correct filesize and imagesize of the search. After fetching the old 01.jpg-10.jpg files out of the dustbin (Papierkorb) i got the preview from the last search I did with the first version. These files don't get updated. But the image- and filesize corresponds to the search i'm doing at the moment. And when I click on one of the previews, I also get the file which corresponds to the current search. EDIT: it seems that this problem is only true for the google scripts. The old google scripts' preview is also not working anymore (at least with the new tool version). Maybe google changed some code. The Command Line with ws01, ws02,... is great. Unfortunately I use &p already for my Discogs &Pone scripts. I guess there is no easy way for the user to change this requirement in you tool. Google made a little code change so the preview url wasn't good anymore. I've fixed it. The $or() code works, my goal is to skip the album artist if it exists. You're code would show the album artist. Maybe I can add an ini file for a shortcut option. Ah, ok. I thought it would be a good idea to include the album artist in the search. Gives better results. You can try this new version. You can set your desired shortcut key. Also it's possible to use your default image program for the large previews so you can see the covers in full size. I'm pretty amazed from your tool. The opportunity to start it within Mp3tag with the parameter corresponding to scripts is pretty fantastic. Didn't see that at the first look. There alway comes a message: "Information: You have reached the last folder." I tried different sorting of the folderpaths, but always the same. Am I doing something the wrong way? It depends on your folder structure. The current "next folder" algorithm is not so good. It can only go to folders that are on the same level. You must load the folder album1 in Mp3tag. It doesn't work when you start from root. Ok, that works. I started from the root before. Would be better if the algorithm checks for the next path inside the mp3tag file list. But I can do this myself by selecting a file (or all files if i want to store the image inside the tag) from the next album and pressing the ws01 button. Nice feature that your tool always keeps on top. I've tried this. Following the "Liesmich.txt" I unfortunately get always an empty window on a search. It's all in the ReadMe files. Did you use the "Cover Preview#..." src files for searching? 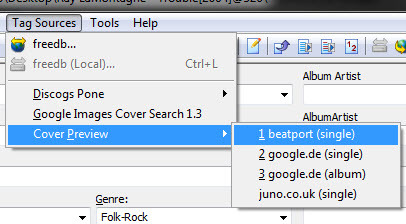 Show a screenshot of the Mp3tag search result window. I noticed that search related album pictures 01.jpg to 10.jpg getting stored in the Mp3tag prog directory. But I guess thats not the way it is intended to work. These pics are overwritten on every new search, by the way. The CoverPreview window is allways in foreground (even the taskbar!) which is really annoying. Have to minimize it to work with Mp3tag or other apps. In which folder / path did you put the MCP.exe file? Are the images downloaded to the same location? How about if you added a a dropdown browse box right below the image description in Mp3tag that allowed you to browse the folders and files on your computer and select an .jpg or .png file to use to over-ride and replace the cover art if it's wrong or to replace missing cover art. Just right click on the image! This has stopped working for me for the last while. I cant put my finger on it. 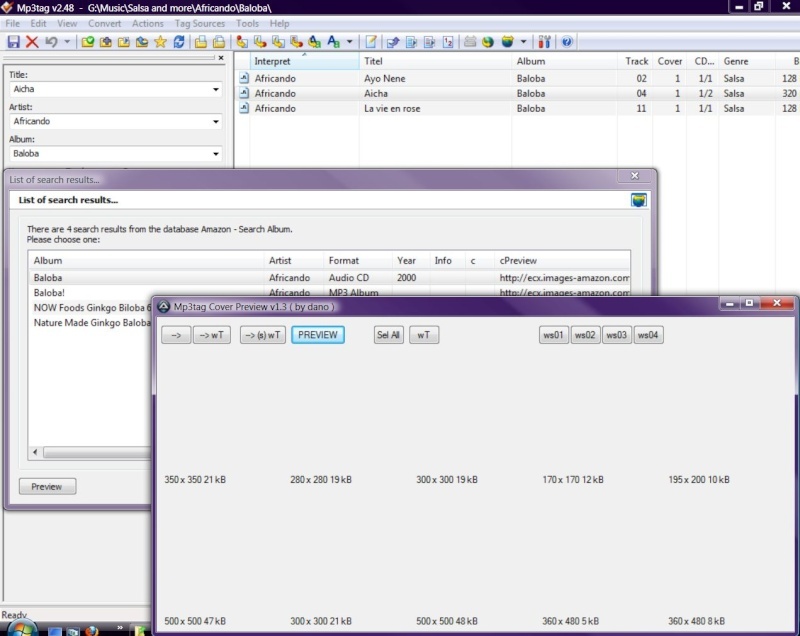 I've uploaded a screen-shot of the tagsources dropdown menu. I open up the app, hit the wso1 button but nothing happens. and the location of the script is F:\PROGRAMS\Mp3tag\data\sources **Note i have a portable version of the app. Maybe an update in mp3tag has caused this great wee app to stop working. Hm, I have no troubles. When you press Alt+S, P, 1 in the program does that call the web source? Can you show an image of the whole caption and menus in Mp3tag?